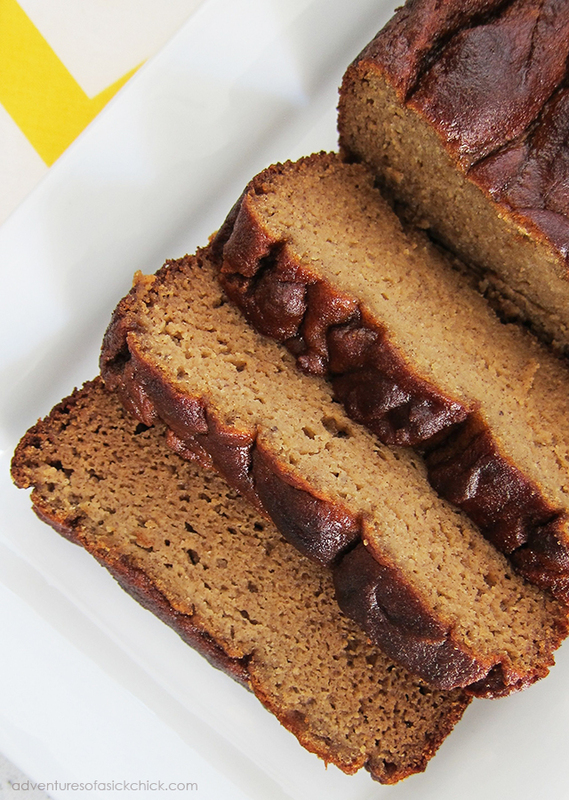 One of the things I missed most after going grain-free was my mom’s “famous” banana bread. Her recipe was the best: my favorite sweet treat and the most moist and flavorful banana bread I’d ever tasted. But it consisted of my two mortal enemies: wheat flour and refined sugar. So I finally decided I needed to create a grain-free version that would rival, if not surpass, the original. 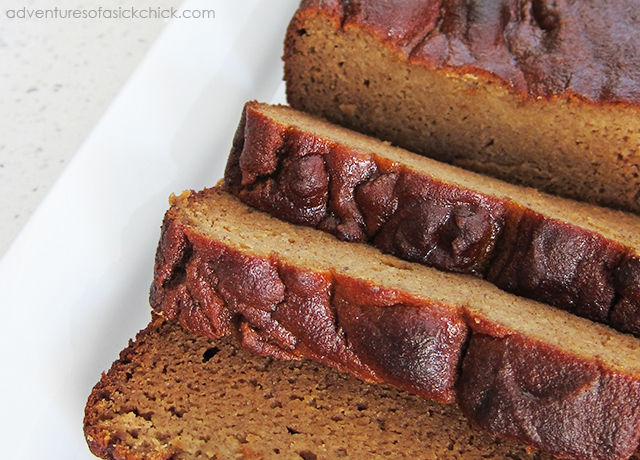 It took lots of experimenting, but I think this Paleo banana bread recipe is comparable to (if not better than) my mom’s. In addition to being delicious, it’s really easy to make! 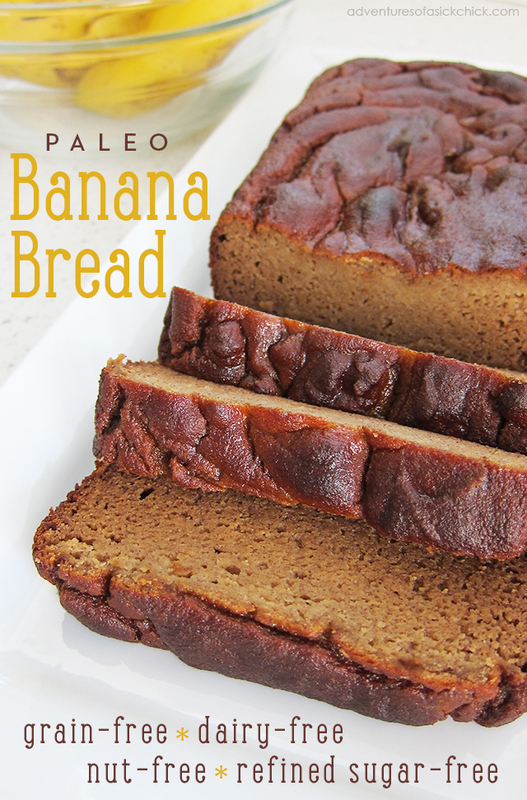 This recipe is comprised of only a few wholesome Paleo ingredients. In particular, I use coconut flour in lieu of nut flours and/or other starches, making it healthy and easy to digest (I prefer not to bake with nut flours when possible, due to the inflammatory nature of nuts when consumed in large amounts). You can read about why I love all-things-coconut here. But the true secret to any good banana bread? The bananas, of course! The key (in my opinion) is to use a lot of bananas, and very ripe ones at that. (They should be very brown…just keep them refrigerated until you’re ready to use them.) The natural sweetness of the bananas means that I only need to add a small amount of honey. Therefore, it’s lower in sugar and completely refined sugar-free, as opposed to conventional banana bread recipes. Adding some dark chocolate chips gives it extra decadence (just be aware that they will raise the sugar content), but it’s equally as tasty without the chocolate. Preheat oven to 325 degrees F. Line the bottom of a 9x5 loaf pan with parchment paper and lightly grease the sides of the pan (I use coconut oil). Mix eggs, oil, honey, vanilla extract, and apple cider vinegar in a medium bowl. Fold in coconut flour and baking soda and mix thoroughly (an electric mixer or power blender will produce the best results, but hand mixing works too). Add in mashed bananas and mix well. If using chocolate chips, fold most of them into your batter. Set aside the remainder. Pour batter into your prepped 9x5 loaf pan. Sprinkle remainder of chocolate chips on top (this is recommended because sometimes the chocolate chips sink to the bottom while baking; this will help keep them better distributed). Bake at 325 degrees F for 50-60 minutes, until the top is golden brown and an inserted toothpick comes out clean. Let cool and enjoy! Store in an airtight container in the refrigerator (I actually enjoy this banana bread even more once it’s been chilled! ).